Today’s post is a small pavilion, four-square with on-center columns at each facade, radius-ed corners, each topped with a miniature turret and blended into a larger hip roof. Bits of Richardson clash with modernist modularity, postmodern idiom, and multiple readings in the plan (a diamond? a cruciform? nine-square even?). While I’ve drawn the exterior in brick, it could work wonderfully shingled or in clapboard, perhaps even stucco. 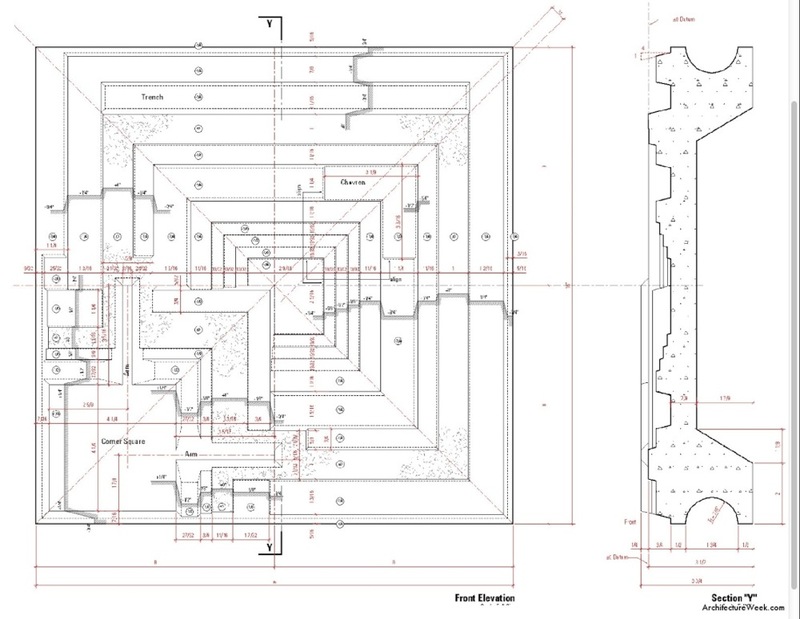 Another Gill-inspired project, this time taking planometric cues from Ungers, with a large central hall that cuts through three stories to a pyramidal skylight atop, wrapped in a continuous arcaded portico all around. Maybe this one could do with killer attic spaces, for a fourth floor. Or rather, I drew more of the same courtyard I’ve drawn before. Particularly, I wanted to see how this plan-section combination would work with my double-axon-section projection (see above). I especially like how the section proper gets lost in the projecting planometric linework, both from the wormseye and the traditional ‘aerial’ axonometric. Linguistics, or the study of language, is today’s topic, expressed in four buildings: On the left, traditional languages are used to express a four square plan (top), and a nine square plan (bottom), with floor plans on the left and ceiling plans on the right. On the right, modernist languages express the same four square (top) and nine (bottom), with symmetrical plans on the left and directionally symmetrical plans on the right – mainly because modernist ceiling plans are far less interesting to draw. . . A section and elevation lie beneath. To celebrate my birthday, my wife took me to see over 20 of Irving Gill’s extant works. I’ve always appreciated this seminal figure, and his lasting impact upon Southern California’s architectural development, but had never taken it upon myself to actually seek out his work in person. Lesson learned. And as much as I appreciate precedent study, that is the representation of existing works through drawing, I believe that history must be operative – that is, we must look to how history can work for us today. Not only what we can learn from it, but what we can do with it. And with that introduction, I give you a small house, three squares in plan, stepped in section, cubic in volume. The articulation of the volumes is typical Gill, with an arcade wrapping the a portion of the ground floor as a screen, yet open to the air above (quoting Gill’s Bishop’s School in La Jolla). The remainder of the details are taken from Ungers, with some Schindler-esque diagonal planning. A square volume set upon two long, cyma-ed walls, enclosing one garden per side, with deep eaves at the hip roof, and hung metal balconies at the second floor. The ground floor walls bi-fold upward, to offer complete movement between the interior and the enclosed gardens. Tall cypresses and vine-covered lattices complete the garden walls at either end. I really should flesh this one out a bit more, methinks. Three sketches, three squares, in anticipation for my 3X10 birthday tomorrow (the 3rd). The first, an elevation, with an arcade atop two square windows in a wall – Traditional form with abstraction below. The second, a plan, square in form, but diagonal in organization, with a nice entry rotunda on the corner. This is an homage to Schindler’s diagonal square plans (the How House and Bethlehem Baptist Church, plan), and his mentor’s detailing at the Ennis Brown House. The third, in a three-dimensional axonometric, a modernist cube.